Many property owners like having basements, but don’t realize the importance of having a dehumidifier in the space. A basement is like a bonus room that can be used for storage or as extra living space. However, basements are often under assault from the surrounding earth – something that above ground rooms clearly don’t have to contend with. The most immediate example of this is moisture infiltration. Moisture can either penetrate the basement via groundwater seeping in through the foundation, or it can be the result of moisture venting into the basement. In either case, it’s a cause for concern, as prolonged exposure to moisture will eventually damage the building, or its occupants. 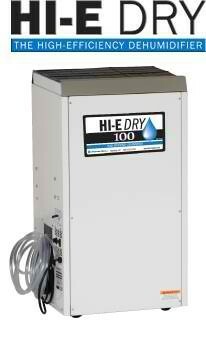 Why should dehumidifiers be considered for basements? A dehumidifier protects valuable equipment – Water is essential for life but is also the enemy of sensitive electronics and metals. At higher levels of humidity, metals will rust and corrode faster and electronics will be more prone to shorting out. Commercial buildings use their basements for housing important technology and essential equipment, so they must be kept in an environment conducive to their preservation. A dehumidifier sets that environment up. A dehumidifier protects the basement too – Humidity acts on the building in insidious ways, damaging it slowly and in ways that are difficult to detect. When moisture seeps into drywall or carpet, it can touch off mold contamination. When water contacts wood, it can cause that wood to swell and buckle. And again, it can accelerate metallic corrosion. If the basement is painted, moisture can cause the paint to peel. There are, in short, no materials inside of a building that should be exposed to moisture for extended periods. A dehumidifier, then, is important for protecting the building’s integrity, as well as the integrity of its contents. A dehumidifier makes the environment less hospitable to pests – In this context, a pest can be mold contamination setting in or a plague of insects. Both prefer warm, humid environments, and both are a problem for the building and the people inside. Mold, especially, is a threat to the structure, as it spreads quickly and cannot be easily removed once it establishes itself. Keeping humidity levels under control is the most important element of fighting a pest invasion. And yes, a dehumidifier improves worker comfort and health – Commercial basements aren’t exactly high traffic zones, but the people who have to spend time in those basements are hard workers. Limiting humidity down there will allow workers to breathe easy and put forth more effort. Also, workers that aren’t constantly exposed to mold and pests are healthier workers, as both can trigger allergies or conditions like asthma. There’s no doubt, then, that a dehumidifier can work wonders for a commercial basement. The question is, what kind of dehumidifier should be installed in a commercial basement, and what features are essential? Dehumidifier selection comes down to a couple of questions. How much air does the dehumidifier need to process, and what kind of environment is the dehumidifier going to be used in? The first is the most pressing issue, as an improperly sized dehumidifier will not effectively keep the air dry. This is a matter of figuring out the basement’s cubic footage, which is a simple enough process. To determine the space’s cubic footage, grab a tape measure and measure out the length, width and height of each room (if there are multiple basement rooms). Multiply those figures together and the result is the cubic footage. Dehumidifiers may be specified according to square footage or cubic footage, but the latter is more precise. Once the basement’s cubic footage is assessed, it’s time to make a judgment call. That number may need to be modified, depending on how humid the basement is. If the room is extremely humid, then experts recommend selecting a dehumidifier that is rated for a higher cubic footage, as this means the dehumidifier will process the basement’s air more often. For example, if a basement is so humid that standing water is present, then the best choice is a dehumidifier that will change out the air at least six times an hour. If the basement just feels damp and smells musty, then three changes an hour are sufficient. If there are visible stains, mold or mildew, then four or five air changes are needed every hour. Determine how many air changes are required every hour and multiply that number by the basement’s cubic footage. This is the cubic footage number that should be used when selecting a dehumidifier. The other important criteria in making a selection is whether to consider a condensing dehumidifier or a desiccant dehumidifier. A condensing dehumidifier runs the humid air over a set of cooling coils, which causes water to condense out of the air and onto the coils. It’s then routed to a reservoir that either needs to be emptied periodically, or is connected to a gravity drain. A desiccant dehumidifier, instead, uses absorptive materials like silica gel to pull water out of the air. It works by using a massive vapor pressure gradient between ambient air and the material inside the dehumidifier. A condensing dehumidifier tends to be more efficient at warmer temperatures, while a desiccant dehumidifier operates better at low temperatures, and can keep operating even in subfreezing temps. Desiccant dehumidifiers are also the better choice when deep drying is needed, which may be the case in rooms with a lot of electronics. In the end, the right dehumidifier will be different for every building, but as long as it covers the entire basement and is a proper fit for the building’s environment, then it will be a dependable means of controlling basement humidity.